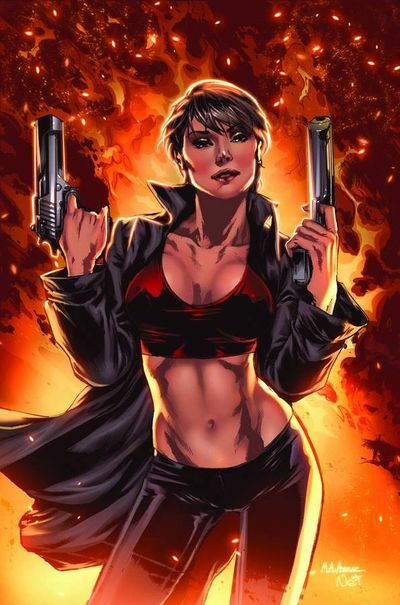 In Grimm Fairy Tales #29, contract killer Mercy Dante committed the unthinkable and ultimate act of evil. Now witness her story firsthand as her past comes back to haunt her and Sela arrives to offer Mercy one and only shot at redemption. The prequel story to Zenescope’s upcoming Grimm Fairy Tales’ Dante’s Inferno mini-series is here! If you have been following the Zene-Verse through Grimm Fairy Tales, this one is a must-not-miss. We get the complete story on (ok, maybe not the complete story) Mercy – what made her the killing machine she is, why the ghost of an innocent girl haunts her and ultimately how she gets redemption. This issue not only leads directly into Dante’s Inferno but also provides one more chapter in the tale of the war being waged by Sela Mathers. Sela’s story is the ongoing arc that connects all of these modern re-tellings of classic yarns. Overall, the concept of Grimm Fairy Tales as a book is genius – great episodic tales that are a combination of action, suspense and horror – combined with this ongoing movement towards some great conflict between Sela and death. Having said that, I just want to throw out a Pullbox warning here, just because these are labeled as fairy tales, that does not make them kid-friendly, biot the story content and level of violence in this issue makes at least a teen+ book. As a stand alone issue, this works because Mercy’s story is self-contained here with enough recap that if you walked in on this issue, you still have it. The story was face paced and tension-packed, the art was more than competent. For the Grimm fan, this might not be the best issue you ever read, but it still was very solid.